Todd built and installed our pantry doors today. I worked on trim. Mellissa played with Todd’s kids. Collin rolled insulation in one of the basement walls. 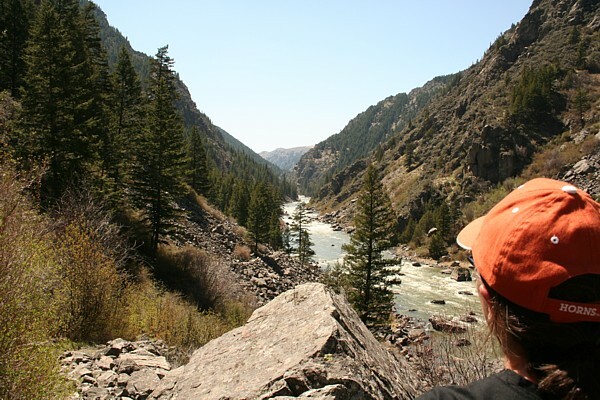 Here’s a picture of Mellissa in Bear Trap Canyon between Bozeman and Ennis, Montana in 2006. This was one of our favorite hikes. Some people carried snake shot in their pistols because of the rattlers in this canyon. We only encountered one rattler on the trail…Collin nearly stepped on it. Same day as the rattlesnake and only a hundred feet up the trail Collin and I met a black bear. Of course, as most black bears do, it ran away before we had a chance to back off. We’re really missing Montana. We’ve been back to Kalispell/Whitefish/Glacier once since we moved to Spokane but haven’t made it over to Bozeman, Yellowstone, or even Missoula (which is only a 3-hour drive). Maybe when the house is finished.